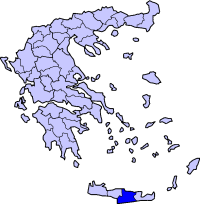 Paliani (Greek: Παλιανή) is a former municipality in the Heraklion peripheral unit, Crete, Greece. 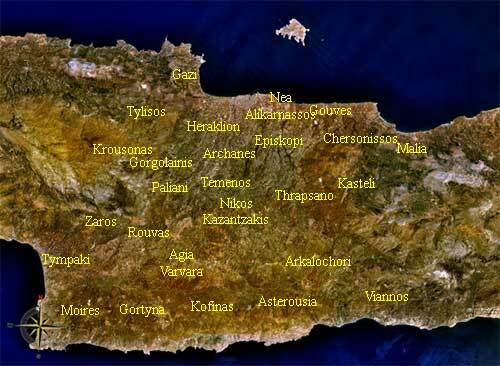 Since the 2011 local government reform it is part of the municipality Heraklion, of which it is a municipal unit. Population 2,404 (2001). The seat of the municipality was in Venerato. 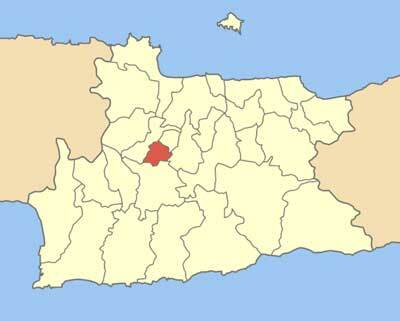 Until 2002, the municipality was named "Tetrachori". The municipal unit of Paliani, named after the nunnery on the outskirts of Venerato, consists of the following villages; Kerásia, Veneráto, Avgenikí, & Síva. Kerásia Κεράσια is 18 km from Iraklio, south by the national road. Kerásia is a small proud Cretan village in Iraklion prefecture, surrounded by the other villages. There are different ideas as to how Kerásia gets it name. There are also two spellings. Kerassia and Kerásia. Some believe it comes from the word for cherry tree – which is the same word. Others say it comes from the Greek verb kerno which means ‘to offer’. Kerasia sits at the foothills of Mt Psiloritis, in a gently sloping valley. It is a small agricultural village busy producing sultanas, grapes and olive oil. The olive groves and vineyards are interspersed with each family’s perivoli orchard or garden, with mandarinia, lemonia, walnuts karidia, lots of other fruit and vegetables. Yards with pigs and goats are dotted about. With about 40 families, some of Kerasia’s houses are closed up, their owners in Iraklion or further such as Germany, USA or Australia. This creates odd pauses in the village as you walk through the narrow streets, strange crumbled buildings and forgotten, empty corners. This is slowly changing as people return from the diaspora. The village sits just up from the national road and with close access to both Iraklio and the thriving cornucopia of Messara, it has been on the trade routes of the island for many years. The first notation of the village dates back to 1583. Kerásia has two churches, Agios Giorgos in the lower village near the kafenion, and Agios Síllas Άγιος Σύλλας higher on the hill. These are both well loved churches, worth a visit and are fully functioning alive churches. The small country roads around Kerásia will lead you to another church, in a glorious, inspiring setting, I Panayia i Faneromeni Παναγία η Φανερωμένη, meaning roughly The Apparition of the Virgin. This is a tranquil and relaxing setting, with many large trees and picnic tables to enjoy the view of the little gorge with cypress pines. There are some very old gnarled olive trees on the way to this shrine, a short 10 minute walk from Kerasia. The church is sitting looking over the valley with the rocky hill behind it. Goats roam up there. Sometimes the only sound will be acorns falling on the roof of the church. Other times you will hear the loud interruption of a motorbike, as the lad from the village comes to look after the shrine and light the candles. This gorge is part of the European walking trail E4. The hub of village life is the kafenion. The kafenion in Kerásia is a very simple affair. Life flows slowly and quietly by, however if you sit a while and allow yourself to slow down, you will find the parade of life passes by the doors of the kafenion. Our deputy mayor, a resident of Kerásia, put it this way “the kafenion is the university of life”. Discussions start slowly, at times you can walk in and believe no one is talking to each other. Sometimes the room is full of smoke and shouting. Sometimes there are card games; sometimes the TV is turned up very loud. Each village kafenion will be different. Seek out your village kafenion and sit a while. Get to know the way of things and always, always respect the old people in your village. They will teach you more than you will know. When you enter a home or kafenion in the village, you will be offered a coffee kafé or a raki, in Cretan known as tsikoudia. Accept. Enjoy. In Kerasia you will be treated with the most wonderful hospitality.